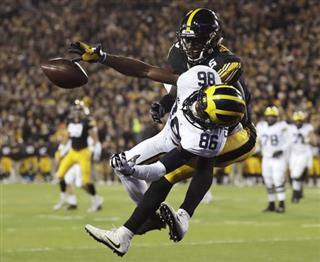 IOWA CITY­ – It’s rivalry week in the state of Iowa. The annual Iowa Corn Cy-Hawk Series rivalry game is this Saturday at 11:00am at Jack Trice Stadium in Ames. Both teams enter the game with a 1-0 record after impressive wins over Wyoming and Northern Iowa, respectively. Here are some key match-ups we think could decide the outcome of what we expect to be a close, gritty, and entertaining football game. Iowa State wide receiver Allen Lazard will without a doubt be the most electrifying pass catcher on the field this Saturday, and Iowa’s relatively inexperienced secondary will have their hands full. The Iowa secondary had a phenomenal week one against Wyoming, which should certainly make Iowa fans feel a little more confident before facing Lazard, who went for 108 yards last week. Josh Jackson made five tackles, broke up a deep pass, and intercepted Josh Allen, earning him spots on Pro Football Focus’ Big Ten and National Defensive Teams of the Week. Before the season, Manny Rugamba was listed as CB No. 1 for the Hawkeyes, but after being suspended for week one, the consensus is that Iowa is more comfortable having Jackson cover Lazard since he has a game – a really good game at that – under his belt. Rugamba will not be able to ease his way into the mix by any means. If Jackson covers Lazard, that leaves Rugamba to cover Hakeem Butler. Butler caught five passes in week one versus Northern Iowa for 75 yards and a touchdown. He is quarterback Jacob Park’s second option at receiver, but he plays like a number one. Lazard and Butler have significant size advantages over Jackson and Rugamba. Lazard and Butler are 6’5 and 6’6, while Jackson and Rugamba stand at 6’1 and 6’0. These outside match-ups will likely play a huge part in determining this Saturday’s game. Iowa State running back David Montgomery rushed for 82 yards and two TDs last week against Northern Iowa, but Iowa’s front seven will be a lot tougher to get through this week. One player in particular stands out, and of course that’s middle linebacker Josey Jewell. Jewell received several awards for his week one performance against Wyoming. Fourteen tackles and two sacks are numbers anybody can boast about, but Wyoming’s running game is not at the level of Montgomery. 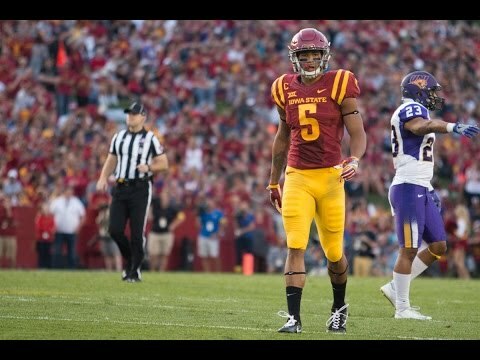 Montgomery improved mightily as the 2016 season rolled along, making him the featured back for the Cyclones in 2017. The sophomore is a powerful, downhill runner who will get lots of touches in the red zone. That’s where Jewell comes in. Jewell has proven that he can stop anybody in the country, but the Hawkeyes have not seem Montgomery much in the past. The Outlaw and his linebacker buddies Ben Niemann and Bo Bower have to ready to make some red zone stops against this powerful runner on Saturday, or else he might finds his way into the end zone a couple more times. Sophomore quarterback Nate Stanley was good, not great, in his first start as a Hawkeye last week. His tight end Noah Fant helped him find a rhythm, and I suspect Fant to be an impact this week as well. Iowa ran multiple two tight end sets against Wyoming. The offense benefited both on the ground and through the air. Fant caught two passes, both for touchdowns, in the 24-3 win. His speed allowed him to get open against Wyoming. On his second touchdown grab, Fant blew past a Wyoming linebacker to break free before Stanley dropped a pass right into his hands. Tight ends aren’t often known for their speed, which is something Iowa State’s outside linebackers will have to adjust to. Marcel Spears, Jr. and Willie Harvey will likely match up against Fant in coverage on multiple occasions Saturday. Stanley, like many Iowa quarterbacks before him, enjoys looking for his big tight end to get the offense up and running. Fant was a target in the red zone last week, and he should be the primary option this week in Ames. Spears and Harvey have to be ready to keep up. 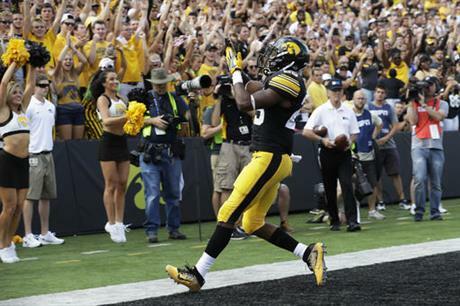 Not to blow smoke, but Akrum Wadley is really, really good. Iowa’s premier running back was held in check last week against Wyoming for the first quarter, but he was hard to bring down after that. Wadley finished the game with 116 yards on the ground. In last year’s Cy-Hawk game, he ran for just 49 yards as the backup to LeShun Daniels, Jr., but he did have two touchdowns, one of which was through the air. Iowa State has plenty of film on Wadley I’m sure, but even when Wadley is “contained,” he manages to jump-cut his way to a 100-yard performance. Much like the Montgomery-Jewell matchup, Iowa State is going to rely on middle linebacker Joel Lanning to stop Wadley. In his first game back on the defensive side of the ball, Lanning recorded seven tackles and forced a quarterback hurry. The senior linebacker has to recognize schemes and get the defense in the right place on Saturday if they want to have any chance of keeping Wadley contained. Wadley and James Butler are keys in this game for the Iowa State defense. If they can shut down the running game, they force Iowa to throw, which is not the primary option for the Hawkeyes. All things considered, bragging rights are totally up for grabs this weekend in Ames. It might just come down to who wants it more.